Paper-pencil-games for a rip-roaring time with your kids. Name, Place, Animal, Thing. A learning game. (If you want to look up another category of games return to the HomePage ). How many Players do you need? 2 or more. Although paper-pencil-games are simple in terms of materials needed, the rules of the group game have to be clearly specified. As the rules are not written anywhere, specifying them at the beginning of the game rules out any confusion later. 3. The Caller calls out 'Start'. 4. The Reciter recites the alphabet in his mind (inaudibly). 5. A couple of seconds later the caller calls out 'Stop'. 6. The reciter calls out the letter of the alphabet when he was cut off. 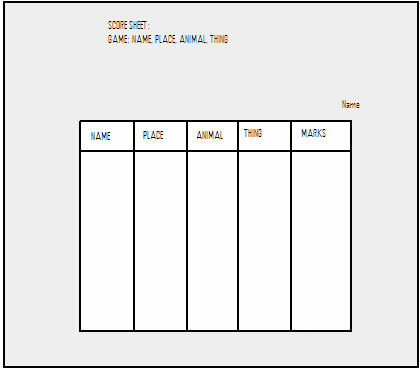 Once the above rules are specified, Name, Place, Animal, Thing starts with the steps mentioned above. Paper-pencil-games: Remember this is an example of Paper-pencil-games that make for rip roaring fun. So watch what happens next. 7. Immediately all players (including the caller and the reciter) start to fill in the columns in the score sheet above with nouns that fit the categories and which begin with the letter called out by the reciter. 9. At this point there are a lot of groans, moans and cries of "not fair!" 10. At the mention of "...tick-tick ten" everybody stops writing. You'll hear someone mumble, "Wait till it is my turn to do the countdown. I will finish it as fast!" 11. Beginning anywhere all members of the group read out their entries for that letter. 12. At this time you will hear quite a few cries of "Hey I have the same word! ", "Oh! Oh! There go my 5 marks!" "There's no name like that!" "There is too. It's a Korean name!" 11. Each entry gets 10 marks. If any entries are similar, all those who have similar entries get 5 marks for those entries. If any one was not able to make an entry on time in any category she loses ten marks per unattempted entry. The maximum marks a player can win per letter are 40. The least marks a player can get for a letter is 0. 12. The whole game can be repeated for as many letters of the alphabet as the kids would like to explore. At the end of the game, the players will add up the marks they have scored for all the letters. Whoever gets the highest score is the winner. 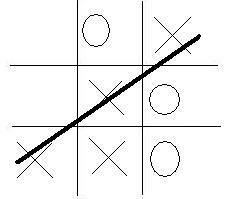 Name of the game: Cross and Dots (also called tic-tac-toe in some parts of the world). 2. How many players do you need? Two Players. 4. How do you play it? On a sheet of paper draw a set of Cross and Dots Grids, say 10. A sample cross and dots grid is given below. 5. The symbols of 'X' (cross) and 'O' (dot) will be used to play. 6. Assign the cross symbol to whoever is beginning the game. Consequently the second player gets the dot symbol. 7. The first player puts the cross in the central box of the grid. The second player puts his dot in any box he wishes. 8. The grid may now look like the following picture. 9. Now the first player puts her cross in a box which help her monopolise the whole line of boxes. The line she wants to monopolize could be horizontal or vertical or diagonal. 10. The second player has two goals. Her first goal is to prevent the first player from conquering a whole line. Her second goal is to try and conquer a whole line herself. 11. To achieve the first goal she has to be on the lookout for two crosses in a row. Immediately she has to put a dot in the third box of the row and thus stymie the completion of a 'crosses' row. Simultaneously she has to look for a way to make a row full of dots. This will help her achieve the second goal and win the game herself. 12. As soon as one of the players wins the game she has to draw a line through the completed row. 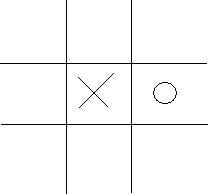 The following figure shows the winning grid for the player with the cross symbol. 13. The winning player writes the initials of his name to stake ownership of the grid. 14. The next round starts. This time the second player gets the first go at putting his symbol on the grid. 15. The game continues until all the grids on the page are covered. 16. The player with the largest number of winning grids wins this paper-pencil-game. Here's another way to play the Cross and Dots Game. If you would like to know more about experiential-learning and designing trainings with games please contact us.